Lauren and Shane are the type of couple that come off as laid back, easy going and mellow. And don’t get me wrong, they totally are. But Shane’s got this charming quirky side that keeps a constant smile on his fiance’s face, then Lauren’s got this amazing spark in her eye that makes me wanna follow her into the night. 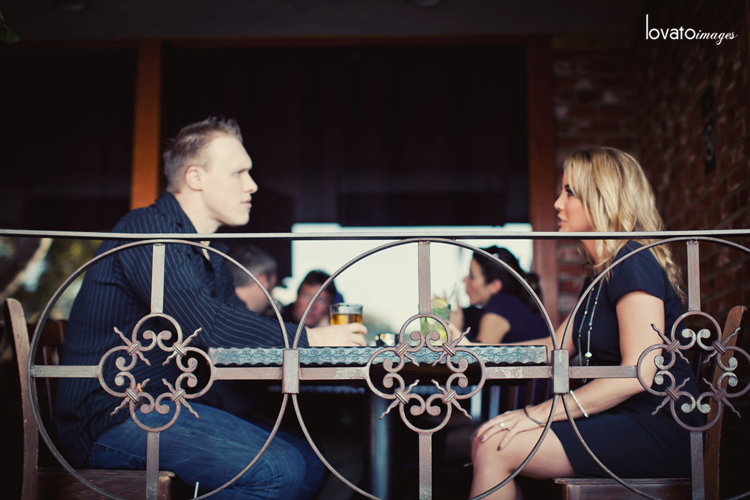 We started out with a drink at the Ocean Brewery to get the kinks out, cause hey, a cold beverage is a great way to start any date. I knew this shoot was going to be a good time when Lauren and Shane told me they love going out for dinner dates. My kinda peeps! Next we poked around downtown, because Lauren and Shane love to window shop. More brownies! Then Shane began to model hats for us and the laughter began and never stopped. These two are just a fun couple, so fun photos were inevitable. They’re just a darn good time. We brought their adorable pooch Zoe out to play when we got to Victoria Beach and I think the images on the sand represent so much of who they are together: playful, free, romantic, bold, tender, and totally full of love. I’m full from this session: full of happiness, full of good memories, full of conviction and confidence in their successful marriage to come. I have no doubt that Lauren and Shane’s day will be one of the best weddings ever. With a couple this awesome, it’s a guaranteed good time. If you liked what you just saw here, sign up for The Picture of the Every Couple of Days. It’s an email I send out every couple of days with one image and a few words. It’s a nice refresher for your inbox, aiming only to keep your interest enthused and your inspiration engaged. Check out the most recent Picture of the Every Couple of Days here.